Want to stop people from entering your room when you are not there? 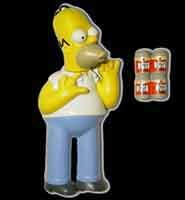 Then the Simpsons Homer room guard is what you have been waiting for. The unit has five funny prerecorded messages, or you can record your own to dissuade intruders from entering - I found an evil laugh to be the most effective. These devices are not new, but I found it kind of cool having Homer stuck on the outside of my door - until my girlfriend told me to grow up. This will be of great fun for kids of all ages and it will also protect their rooms from their parents while they are at school. A word of warning though. It is strongly advisable to turn the damn thing off for when you are in the room as it can be annoying after a while. One other thing that a small relative of mine pointed out to me was that this could be used to trap Santa Clause at Christmas. Don't sit up all night waiting for him to show. Fall asleep and Homer will wake you as the rotund one enters to fill your stockings.